I’ve been wanting to do this for a minute. 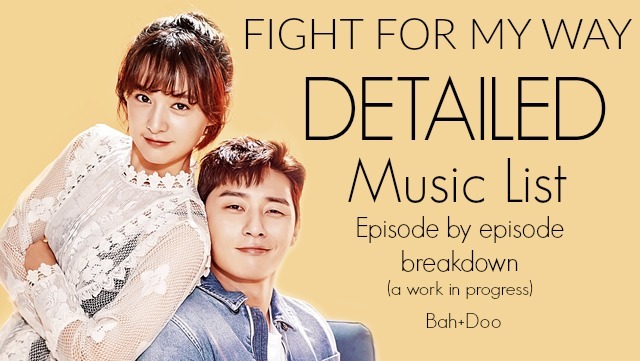 We are trying to put together a complete music list of all the music that was in Fight for My Way in each episode. Your help is greatly appreciated, so if you see a song that we missed then let us know. I’ll keep adding links and music to this list until it is complete. I took most of this list from our live recap links, but I need to rewatch a few of the episodes to help fill it in. What was the song played in episode 15 (11:16)? Finally have the clown song and i feel so stupid. It’s the same song Aera sang on the beach. Hi Micro-Hulk! We missed you 🙂 We will look into it for you! We re-listened to the end of episode 1 and we heard the English version! I think you are right about that. We haven’t been able to find it yet though. It is a mystery. We will keep looking for it, hopefully we find it. Yes, admin. It’s still a mystery for me since that time. Please share it if you found it. Thank you so much setare! Here is another one for you to add. At the beginning of episode 15 is IU’s “When Love Passes By” (사랑이 지나가면). At first, I could not recall what song it was till I came here and realized it was IU singing. So thanks for all you do here. Adding it now! Thank you Peter! What is the song in ep 10 when Ae Ra, Sul Hee, Dong Man & Hye Ran at the cinema? Hmm, I’m not sure but someone might have answered this on the episode 10 recap? I feel like someone else had this questions in the comments somewhere. What is the name of the song played in episode 3 at 9:35? What is the name of the background music played in episode 3 when Dong man comes out of the shower after singing a funny loud song and sees Aera trying to take some utensils. The music which is being played when they both stare at each other….